These should be good times for the “alter-globalisation” movement. The unprecedented combination of crises in the global economy, environment, and governance makes its argument for a just and equal world – “another world” – seem more relevant than ever. Yet the 100,000 activists expected to assemble at the eighth World Social Forum (WSF) in Belém, Brazil, from 27 January- 1 February 2009 are at a crossroads. The ideas they have been proposing for much of the last decade have in many ways been vindicated by the global financial breakdowns, food riots and elite failures of 2007-09; but even as it celebrates the demise of forces it has unrelentingly challenged the movement itself is divided over its political and organisational direction. After its inaugural meeting in January 2001 – a year after the demonstrations in Seattle against the World Trade Organisation (WTO) summit which dynamised the movement – the WSF experienced impressive growth, reflected in increasing participation (from 15,000 to over 170,000 from 2001-05). The forums have become huge meeting-places where people of many nationalities share experiences and discuss local and global issues. The “alter-globalisation” movement (also called the “anti-corporate-globalisation movement” or the “global social justice movement”) has undergone two profound changes since the WSF’s last visit to Brazil, in January 2005. That event, in the city of Porto Alegre, remains the most successful forum of all – in terms of the quality and openness of the discussions, and of the size of the event (200,000 people attended the opening demonstration, and 2,500 workshops were run by 5,700 civil-society organisations). The first great change is in the social geography of the movement, with a notable decline in some of its historical bastions (including most western European countries) but success in important regions such as Africa (where, for example, over sixty national and regional social forums have been organised since 2005) and north America. The second change is the reorganisation of the movement around new guidelines. The internal quarrels about the forums’ objectives and the movement’s political orientations are a symptom of this reconfiguration. The World Trade Organisation meeting in Geneva on 22-29 July 2008 offered a clear illustration of the current state of the social movement. The purpose of the meeting of thirty delegations from the WTO’s most influential member-states was to break the deadlock over the Doha trade-liberalisation process; the failure of negotiations in Seattle (1999), Cancún (2003) andHong Kong (2005) meant that the credibility of the organisation was at stake. Europe’s “alter-globalisation” organisations had been able to mount large-scale demonstrations at the international summits inGenoa (2001), Gleneagles (2005) and Rostock (2007). Yet despite the importance of the WTO conference – and the fact that it took place in the midst of an evolving global economic crisis – they were unable to mobilise their activists at Geneva. The evidence of retreat is unmistakable. Major activists’ networks – such as the Movimiento de Resistencia Global in Barcelona, the Attac movement and most local social forums – have disappeared or declined; continental forums such as those in Malmö (17-21 September 2008, with 12,000 in attendance) and Guatemala City (7-12 October 2008, with 7,500) attracted far fewer people than previously. Moreover, the movement is much less visible in the mass media than in the 1998-2005 period. At the same time, the influence of the movement has been felt in other ways. Many of the institutions charged with supervising international trade liberalisation, which encouraged southern countries to adopt neo-liberal policies, now facediscredit. Whereas in the 1990s, opening a country to international trade was seen as the only path to greater economic growth, by the late 2000s it had become routine for establishment voices and even state leaders to express support for a new global governance system to contain the destructive tendencies of “casino-“, “cowboy-“, “hyper-” or “super-” capitalism. The change of rhetoric reflects a wider ideological shift: the end of three decades marked by the hegemony of neo-liberal ideas. The “alter-globalisation” movement has played an active role in this process, for example by enlarging the space of discussion of trade and economic policies far beyond the realm of international “experts”, and by challenging the neo-liberal orthodoxiesof the Washington consensus. Thus even in their relative retreat from the mass mobilisations of the past, the social movements have won a kind of ideological victory. There is a paradox here: the “alter-globalisation” movement and the organisations and events which compose it seem to have lost much of their capacity at the very time when even prominent policy-makers are coming to believe that the global financial and governance system has in crucial respects failed. In these circumstances, what is the point of the World Social Forum? It could be argued that it more needed now than ever: that is, to contribute actively to the building of a new and fair global order that can address deep problems of poverty, inequality, food insecurity and ecological crisis. The problem here is that the movement is more united in what it has been against than in what it should now be for. In particular, “alter-globalisation” activists divide into three distinct currents about the way forward. The first current of the alter-globalisation movement) considers that instead of getting involved in a global movement and international forums, the path to social change lies through giving life to horizontal, participatory, convivial and sustainable values in daily practices, personal life and local spaces. Many urban activists cite the way that, for example, the Zapatistas in Mexico and other Latin American indigenous movements now focus on developing communities’ local autonomy via participatory self-government, autonomous education systems and improving the quality of life. They appreciate too the convivial aspect of local initiatives and their promise of small but real alternatives to corporate globalisation and mass consumption. This approach is exemplified also in initiatives such as the “collective purchase groups” that have multiplied in western Europe and north America. These typically gather small groups of people who buy from local (and often organic) food-producers in the effort to make quality food affordable, create alternatives to the “anonymous supermarket” and promote local social relations. In many Italian social centres, critical-consumption movements have taken the space previously occupied by the alter-globalisation mobilisations. The “convivial de-growth” and “convivial urban” movements belong to a similar, sustainable and environmentally friendly, tendency. The second current of the movement believes that the way forward lies through efficient single-issue networks able to develop coherent arguments in areas such as food sovereignty and developing-world debt; in turn this work can become a route to raising broader questions. The protection of water-supplies from privatisation, for example, can be used to explore the issues of global public goods, the role of global corporations and “the long-term efficiency of the public sector”. After several years of intense exchanges among citizens and experts focusing on the same issue, the quality of arguments has considerably increased to the extent that this form of activity has become the core of the social-forums’ dynamic. There are several examples of the effectiveness of such networks – often without media attention. The European Public Water Network’s influence on the city of Paris’s decision in November 2008 to restore municipal control over water distribution is just one. The third current of the movement holds that progressive public policies implemented by state leaders and institutions are the key to achieving broad social change. In the past, “alter-globalisation” activists have struggled to strengthen state agency in social, environmental and economic fields; but now that state intervention has regained legitimacy in the wake of systemic crisis, this more “political” component of the movement believes that the future lies in solidarity with the projects of radical leaders such as Venezuela’s Hugo Chávez and Bolivia’s Evo Morales. The national policies of these leaders (social programmes favouring the poor, or taking control of key economic sectors) and their regional alliances and new institutions (the Alternativa Bolivariana por Nuestra América [Alba] coalition, the Banco del Sur) represent a strong pole of attraction for many activists. 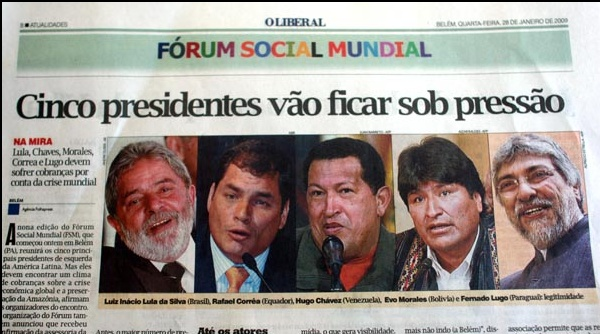 But if Latin America is the main focus for such identification, similar processes have been at work in western countries too; for example, much of the impetus of the first United States Social Forum in 2007 was redirected towards Barack Obama’s presidential campaign. The participants in the Belém meeting can justly welcome the failure of many aspects of an economic model they long opposed. But as they move beyond critique towards a new role in a transformed global arena, can they find some common ground among these three currents? An escape from the crises of economy, sustainability and governance is a huge and urgent task that may last a generation. From this perspective, the three trends of the “alter-globalisation” movement could be seen as politically complementary rather than competing strategies. An imaginative understanding of this kind could be the basis of a shared approach that gives the World Social Forum a fresh lease of life. Social march or disengaged carnival? This entry was posted in Pleyers Geoffrey, Social Movements and tagged Geoffrey Pleyers, Politics, Reclaiming the Commons, Social, Social Movement, World Social Forum, WSF by Daniel Verhoeven. Bookmark the permalink.